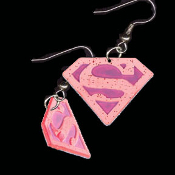 Huge Funky S-Logo SUPERGIRL EARRINGS - Dangle Collectible Costume Jewelry - BIG Dimensional PINK Metallic Plastic Charm, approx. 1.25-inch (3.75cm) tall x 1-5/8-inch (4.06cm) wide. Every comic book Super-Hero Diva Heroine nostalgia collector should wear these!